Day: Saturday, August 27, 2016 NOTE: this event has already happened, find current-year events on the events page. 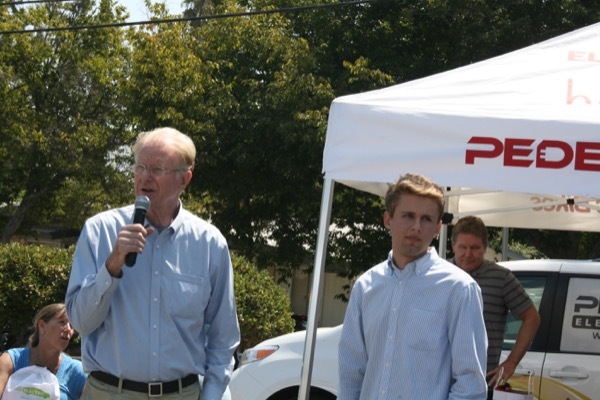 Ed Begley Jr. and Henrik Fisker spoke at the event. For the fourth year in a row, we invite you to Woodland Hills National Drive Electric Week. This year's speakers include Emmy nominated actor Ed Begley Jr. and Henrik Fisker, founder and former CEO of Fisker Automotive, who will be discussing Smart Machines of the Future. Follow us on twitter or instagram at @whndew to hear even more exciting news. BMW, Fiat, and Porsche will be giving test drives, while over a dozen different types of electric vehicles will be on display. For the kids, we will have a Fire Truck, CHP Vehicle, and lots of crafts in the shade. We also have food trucks, an award winning DJ, and a free raffle. There are currently 104 attendees registered. Registered attendees report 238,331 electric miles driven.